There might be another reason for Godzilla’s new hue, though: As i09 reported earlier this year, the new movie will use a combination of CGI and “a towering doll of rippling red muscle that resembles a giant biological anatomy chart” to create the monster for the upcoming Godzilla: Resurgence, a.k.a. Shin Godzilla. So whether this is the look Godzilla will actually sport in the film or an unfinished effects shot isn’t clear, especially since these images were leaked via Toho fan groups on Facebook. The conspicuously monster-less Japanese teaser trailer for the film, which was released last month and is embedded below, isn’t saying. UPDATE: According to Birth. Movies. 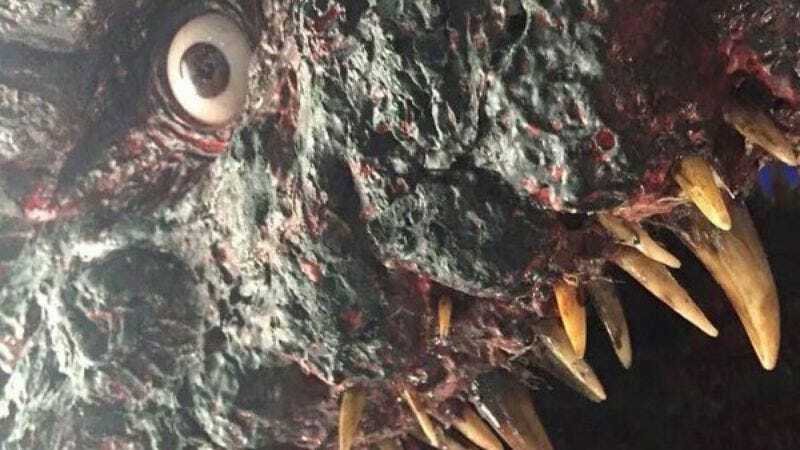 Death., Godzilla’s sunburnt visage will actually appear in the movie, but only briefly. “[B]y his third form, he should look like a much more standard Godzilla,” according to writer Evan Saathoff.